A conversation (not a debate) at the 4Real Forum prompted me to think about how much I don't know about what life is like in other parts of the country. I admit, I was surprised at the number of people who participate in the usual celebrations of Halloween. I don't mean to imply any kind of judgment on my part regarding those who dress up and go trick-or-treating, just a mathematical assumption that the percentage would have been more 50/50 considering it is a Catholic forum. I was discussing this with a dear friend, how I thought the scales would have been more level, and as someone who has lived all over this big ol' country, she helped put it in perspective for me. I have lived in Texas all my life. I spent equal time in Central Texas and South Texas until I came to North Texas for college. We lived in a very rural area until I was 8 and then pretty much stayed in the suburbs. Our first home in South Texas was located on an L-shaped cul-de-sac so it was very private and protected. That is where most of my Halloween memories come from. We were allowed to go trick-or-treating around the cul-de-sac and then only a few houses down the connecting street. I might not remember their names, but I can tell you who lived in just about every home we went to. If we didn't know who lived there, we didn't ring the bell. My brother and I rarely had store bought costumes. We raided mom and dad's closet and put together creative outfits like a hobo, a punk bride (think Cyndi Lauper in a bride's dress), and a clown (gotta love Dad's old 70's ties). My parents really got into Halloween. My mom always dressed up to hand out the candy and my Dad tried to find ways to make our front courtyard even more spooky every year. He was also one of those Dads who would hide in the trees and scare people (usually not the little kids, mostly just the teenagers because he thought they deserved it). When I think about my reasons for opting out of Halloween, I realized... it was to avoid people like my parents! OK. Not entirely, but kind of! My kids have always hated anything with even a remotely spooky feel to it. Ghosts are called marshmallow men, black cats are just cute little kitties and skeletons... well, my kids still don't like skeletons. One time I bought The Professor some PJ's that had this super cool skateboard guy on the front. He brought them to me in a huff when he spotted a skull amidst the swirly designs and decorations. He was right! Back they went. The fact of the matter is that there might be some people today living in a neighborhood very much like the one I grew up in whose children are not terrified by decorations and who don't mind walking through smoke filled courtyards and getting a handful of candy from a green faced woman wearing a black pointy hat because they know that it is really Mrs. So-and-so who brought a ham over when great-grandpa George passed away. I remember what that was like and how much fun we thought it was (um...the candy part, not the grandpa George part). I am sad to say, that's not my street anymore and those kids I knew and had fun with have grown up into the man who answers his door wearing a real live giant snake around his neck or the person who walks around all day dressed as the Prince of Lies (not a little devil with horns on a headband... real horns affixed to his bald head with spirit gum and stage makeup)! notdoing her Math as I type right now. Batman and Spiderman frequently show up in my bathroom needing a wipe so they aren't missing out on anything. With a mama who studied theater, lets just say that our dress up box overfloweth! All. day. long. I like not having to check my kids candy or worry about them walking in the street (our neighborhood doesn't have sidewalks). I like not having to worry about nightmares or being woken up by a little girl who is also suffering from them. I like not having to explain why some people celebrate Halloween (language warning) the way that they do. I like not having to fight the crowds of people who get trucked into a neighborhood just to get more and more and more free candy. I can afford a bag of Milky Ways, even two bags, and we can split them 6 ways. But, unless you think I am some sort of Halloween Scrooge, I always put a bucket of candy on the porch with a sign. It reads... Party in Progress! Happy All Hallows Eve! P.S. How do you celebrate and why? We are very lucky to live in a nice, quiet neighborhood, where we know most of the people. We have a few grim reaper types that come trick or treating, but we poke fun at them (teasingly) and get them all laughing. My mom and I sit on the porch with blankets and cups of tea and Doug takes the kids around. This year we'll have a ballerina, a Leif Ericson and a St. George -- what a group! Like you, I don't like the creepy stuff. 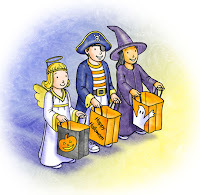 I don't allow the kids to dress up in scary costumes -- and no witches! We keep it fun. But, the most important thing is that they know the root of the holiday. We do let the kids dress up and go trick-or-treating. We have discussed doing more All Saint's activities, but we have not gone beyond discussion. I guess that is at least partly because it would all be on me to make the transition. My kids scare easily, so we don't go to any houses that have any kind of frightening decorations. They never eat all of the candy b/c they forget about it before it is gone. We enjoy doing this with the kids because it is something we did as kids. However, I am going to try to teach them more about the real holiday.